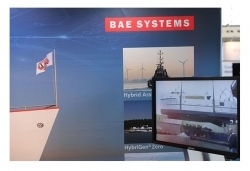 BAE Systems has used this year’s Electric & Hybrid Marine World Expo to share details of Golden Gate Zero Emission Marine’s (GGZEM) US$3m grant from the California Air Resources Board (CARB) to build the first hydrogen fuel-cell vessel in the USA. The 21.3m (70ft) aluminium catamaran ¬– named Water-Go-Round in a nod to how the technology works ¬– is designed by Incat Crowther, has a 22kt top speed and will be built by Bay Ship & Yacht of Alameda. The vessel is powered by dual 300kW electric motors using independent electric drivetrains from BAE Systems; power is generated by 360kW of Hydrogenics proton exchange membrane fuel cells and lithium-ion battery packs. Furthermore, hydrogen tanks from Hexagon Composites, with valves and hardware from OMB-Saleri, are installed on the upper deck and contain enough hydrogen to go up to two days between refuellings. GGZEM’s fuelling arrangement allows Water-Go-Round to be fuelled anywhere with truck access. After the vessel is launched in mid-2019 it will operate for three months in San Francisco Bay. During this period, Sandia National Laboratories will independently gather and assess performance data. 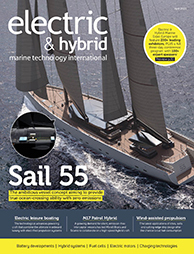 CARB will use the real-world data to verify the suitability of the technology for marine use. The partners will also collect feedback from passengers and operators to assess the best commercial markets. Red and White Fleet will operate the multi-purpose vessel for the demonstration, and plans to purchase Water-Go-Round as the first of several vessels with GGZEM integrated powertrains in order to meet its commitment to a 100% zero-emission operation. Funding for the CARB grant comes from California Climate Investments, a state-wide programme committed to reducing greenhouse gas emissions. The Bay Area Air Quality Management District (BAAQMD) is administering the project.